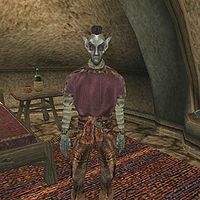 Daynes Redothril is a Dunmer pawnbroker who has a shop in Ald'ruhn. He is one of several merchants in the city who has a problem with Ienas Sarandas's outstanding debts. (First time speaking to you) "I'm Daynes Redothril, the Pawnbroker. And you are... %PCName? Shall I tell you about my trade? Or would you perhaps be interested in doing a little work for me?" (Disposition at least 30) "Go ahead. Look around. You see something you want, let me know. I can also tell you about my trade. And, if you are interested, I might have a little work for you." "I am looking for a fellow named Ienas Sarandas. I sold him two fine matched rings, one with an raw ebony stone, the other with a raw glass stone, but he has failed to pay the remaining 150 drakes owed. If you will find Sarandas, and either get the ebony ring and the glass ring and return them to me, or get the overdue payment of 150 drakes he owes me, I will pay you 50 gold." "Thank you again. You handled the affair very well." "The young fellow's family has lived in Ald'ruhn a long time. His parents died recently and left him their house and estate. But Ienas has fallen in with a fast crowd. I believe he's taken to drinking expensive liquor and has incurred some gambling debts. He's a charming lad, everyone likes him, but he's not very sensible, and suddenly becoming rich seems to have made him an irresponsible fool." "Have you heard he has given his house to the Temple and is studying to be a priest at the Ald'ruhn Temple? The word is all over town." This page was last modified on 18 January 2015, at 02:46.